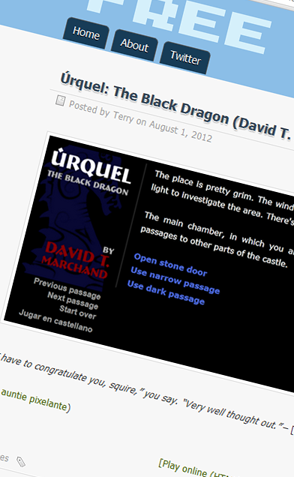 My game Úrquel, the black dragon was kindly mentioned by Terry Cavanagh at Free Indie Games, a blog where four people share short original games they find around the web. There's not much to quote, since the blog has this rule about not reviewing the games it recommends. But I want to say it means a lot coming from Don't Look Back's author, and I find FIG to be a sanctuary of "good taste" in the matter of videogames.